Last week, as our Wednesday night house church group was winding down, discussion arose as to who should host the next week’s get-together. I excitedly volunteered to have everyone over to Drew’s and my apartment, since none of our Grade Midtown friends had been over yet. Actually, aside from Drew’s grandparents coming over for dinner one Sunday night and having a pizza night with some other friends, no one had visited us in our new home. I also knew that Drew and I had set aside time that weekend to give our apartment a good cleaning, as well as make a trip to IKEA. After working hard to make our house spick and span (and indulging ourselves at our favorite furniture store), it would be the perfect excuse to invite people over. Saturday was an incredibly busy day for us. 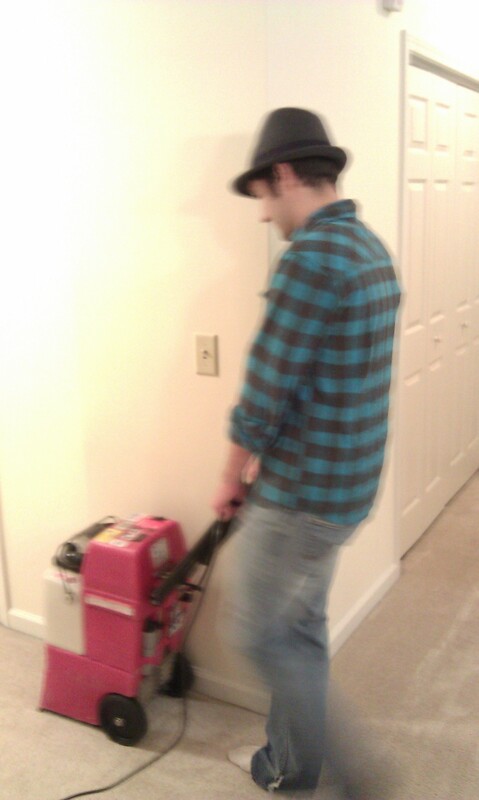 Drew rented a Rug Doctor from Publix and used it to steam clean our carpets throughout the entire apartment. It was something we’d being wanting to do for at least a month, but with our busy weekends full of traveling, we hadn’t yet found the time. A word of advice: if you’re thinking you can steam clean your carpets in a half hour flat, you’re sorely mistaken. Working as a team—Drew pushing the vacuum and me mixing the cleaning solution that had to be changed out at least 10 times—it still took us a good 3 hours to clean the living room, hall and entranceway, and bedroom. The end result was very much worth the time and money-it looked like we’d have new carpets put in. That afternoon we made our highly anticipated trip to IKEA for a few odd and ends around the apartment. Thinking we wanted an ottoman, we headed in that direction, only to be deterred by the expensive price tag. It was at least double what we had budgeted to spend. After looking around for an alternative, we decided on a white coffee table that perfectly matched our desk and dining table chairs. Now that we’ve had it for several days, I wonder how we went so long without it; it’s perfect for storing our laptops, books and magazines, and my crossword puzzles. We’ve already spent one evening kicking up our feet and eating dinner from the couch. While at IKEA we also found a shelf for the living room, a organization/storage cabinet, a photo collage to frame our wedding photos, and our favorite find of the day-a magnetic chalkboard to hang in our kitchen, complete with a mail storage slot and pegs for our keys. Next time we make a trip to IKEA—which I have a feeling won’t be too far in the future—I’m going to have to have one of the apple turnovers that remind me of the way the kitchen smelled in my Mom and Dad’s house on Christmas morning. I’m sure Drew will go for their infamous Swedish meatballs. One of the best things about taking the weekend to thoroughly clean our apartment and get organized is that it’s made us want to keep things that way! There’s nothing better than coming home from a long day at work to find a clean and organized apartment that faintly smells of cinnamon (thanks to that cinnamon branches we’ve been buying at Kroger, we’re officially hooked). Plus, with my parents coming into town for a visit this weekend, we want the place to be perfect. Last night turned out great-it was so much fun having 6 other couples over for a night filled with great food, friendship and fellowship. 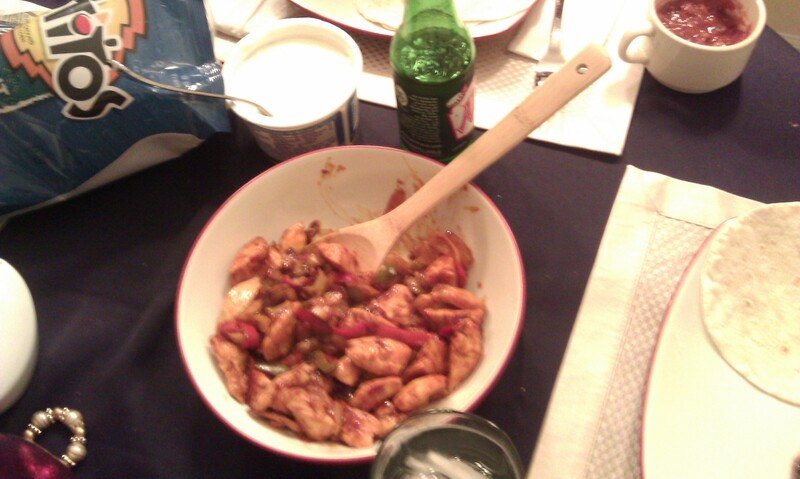 Drew and I made chicken fajitas which went over incredibly well with the group. In keeping with the theme, we also had margaritas, chips and salsa, yellow rice and salad with strawberry cheesecake for dessert. Cooking for 14 seemed a little daunting at first but the amount we prepared was spot-on. Per the request of several people, I’m including the recipe for the fajitas below. They’re incredibly easy and quick to make, and only require a few ingredients. Playing hostess and entertaining friends and family is something I really enjoy doing and wish I had the time to do more of. With my Mom and Dad coming in to town tomorrow night, I’m already planning on making my Dad’s favorite apple cranberry crisp. Now that Drew and I have a place of our own, I hope we can continue to have people over, cook a feast for a crowd, and open up our home to people. Mom and Dad, you’re in for a real treat this weekend! Drew had told me that you had a productive Saturday! Isn’t it fun to entertain in your home?! I love the Fedora that Drew is wearing. He looks really sharp. I knew you would get him styling!! The recipe sounds delicious, too! Jim and I are excited about seeing your place over the holidays….the last time we were there, Drew didn’t have anything on walls due to his anticipation of your arrival and putting your touches into the apartment. I know you are excited to see your parents this weekend!! ENJOY!